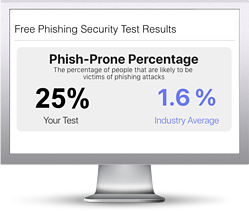 Find out what percentage of your employees are Phish-prone™ with your free phishing security test. Plus, see how you stack up against your peers with the new phishing Industry Benchmarks! Why? If you don't do it yourself, the bad guys will. The Phish-prone percentage is usually higher than you expect and is great ammo to get budget. Start phishing your users now. Fill out the form, and get started immediately! KnowBe4 is the world's largest integrated platform for awareness training combined with simulated phishing attacks. We help thousands of organizations to manage the ongoing problem of social engineering.